A gunman who opened fire on his co-workers at a Wisconsin software company was in good standing at the firm. WTS Paradigm employee Anthony Tong wounded four people at the office’s Middleton headquarters on Wednesday before police killed him in a shoot-out. Three of the victims remain hospitalized in fair condition. The company issued a statement Friday saying Tong was in good standing with the company and was facing no disciplinary action. Police say Tong’s motive remains a mystery. Court documents show a South Dakota judge revoked his concealed-carry permit in 2004 after he acted delusional and paranoid with officers investigating why he had disabled his apartment’s fire alarm. The documents show that at the time, he told officers he thought his neighbors were spying on him and that he believed people at work were “talking bad about him” but refused to explain. A search warrant says authorities seized guns and ammunition from the home of the man accused of opening fire inside his Wisconsin office and wounding four people. The warrant was made public Friday. It also shows that one of the victims was shot 10 times. Police say 43-year-old employee Anthony Tong went on a shooting rampage Wednesday morning inside WTS Paradigm, a software company in Middleton. Tong was fatally shot by police. The search warrant says authorities searching Tong’s home took guns, muzzleloaders, scopes, a silencer, dozens of boxes of ammunition, ballistic vests and a helmet, among other things. Middleton Police Chief Chuck Foulke says Tong was not legally allowed to buy a gun. In 2004, Tong had his concealed-carry permit revoked in South Dakota after police said he was acting delusional and paranoid. All three hospitalized victims are now in fair condition. The fourth victim was grazed. The suspect in a Wisconsin workplace shooting that wounded four people had a concealed-carry permit revoked in 2004 by a South Dakota judge after police said he was acting paranoid and delusional. Court records show officers were called in August 2004 to Anthony Tong’s apartment to investigate a disabled fire alarm. Tong admitted he disabled it. Officers handcuffed Tong and confiscated a handgun and an AR-15 assault rifle and ammunition. The affidavit says Tong told police the weapons were for protection. The affidavit says Tong told police that people at work were “talking bad about him,” but refused to explain. Tony was transported to a hospital’s mental health unit on a 24-hour mental hold. Later that year, a state judge revoked his concealed-carry permit. Tong died after being shot by officers responding to Wednesday’s attack at a software company in the Madison suburb of Middleton. 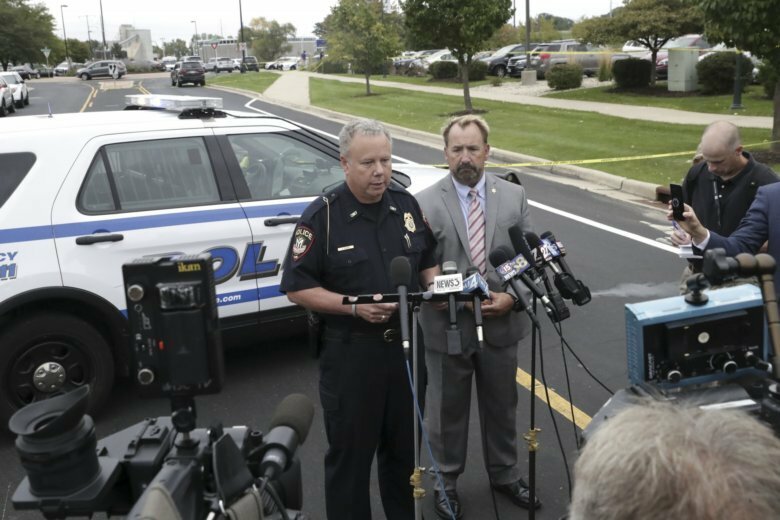 A Wisconsin police chief says authorities are having difficulty tracking down the origin of a gun used in a workplace shooting that wounded four people this week. Middleton Police Chief Chuck Foulke said Friday that the Bureau of Alcohol, Tobacco, Firearms and Explosives is working on tracking the weapon. But he says there is “something unique” about the weapon that is making the work difficult. He wouldn’t elaborate. Investigators say the gunman, 43-year-old Anthony Tong, opened fire on his co-workers Wednesday morning at WTS Paradigm, a software company in the Madison suburb of Middleton. Foulke says Tong’s concealed-carry permit had been revoked and he wasn’t able to legally purchase a gun. The police chief says Tong had contact with police in South Dakota in 2004 due to a mental health issue, but he gave no details. Foulke cautioned it’s premature to conclude that Wednesday’s shooting stemmed from such an issue. Police say the suspect in a Wisconsin workplace shooting that seriously injured three people had his concealed-carry permit revoked and was unable to legally purchase a firearm. Middleton Police Chief Chuck Foulke said Friday that 43-year-old Anthony Tong had “contact” with police in South Dakota in 2004 that involved a mental health issue. Foulke didn’t give details of the South Dakota incident, but he cautioned against concluding that mental health was an issue in Wednesday’s shooting at WTS Paradigm in Middleton. Foulke says police still don’t know what motivated the attack. A fourth employee suffered a graze wound during the attack.